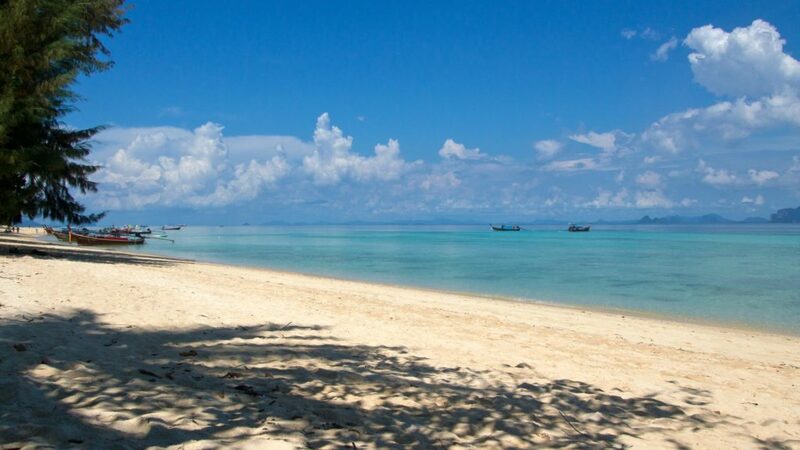 Koh Ngai, often referred to as Koh Hai, is another island off the coast of Trang. 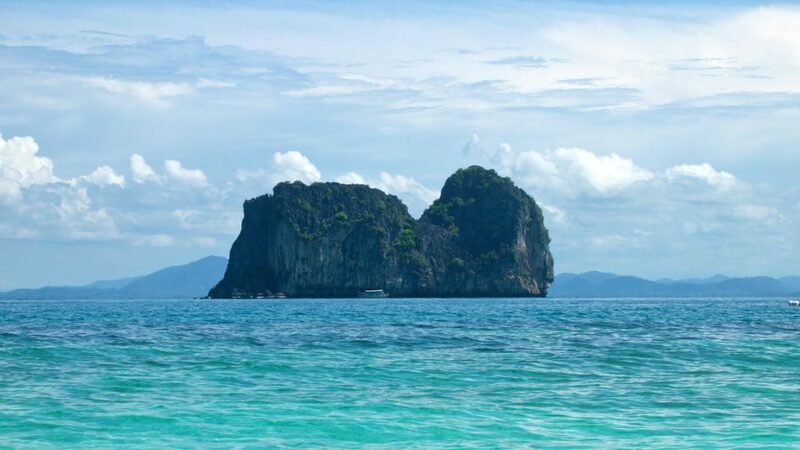 Although it is administratively a part of Krabi, it is mostly visited from Trang and the nearby islands like Koh Mook or Koh Kradan. 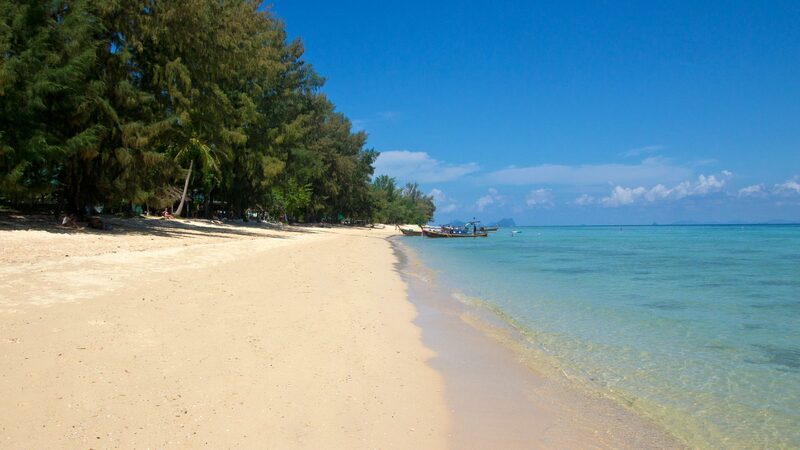 Koh Ngai itself hasn’t much to offer. There are no roads and shops at all on the island. Only a couple of resorts, tranquility and a gorgeous beach scenery. More than enough reasons to give this island a shot during our stay at the neighboring island of Koh Mook. We started our trip at 9.00 a.m. in the morning from our resort on Koh Mook. 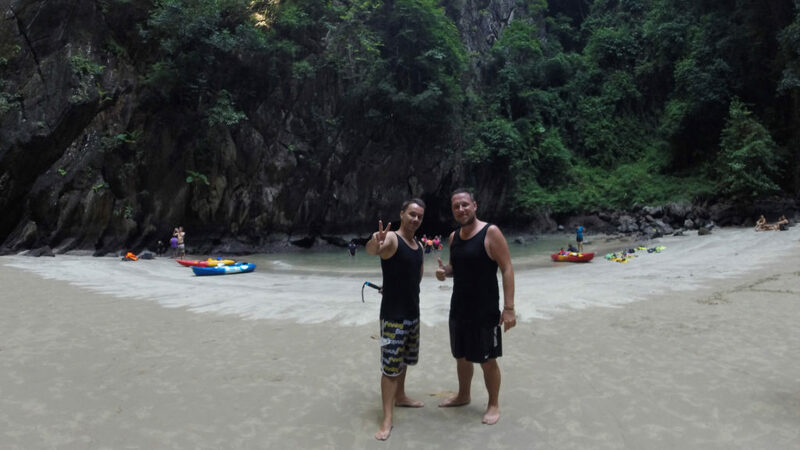 Since we absolutely wanted to visit the famous Emerald Cave on Koh Mook, we arranged that for the same day with our driver. Therefore, this was our first stop of the trip in the morning since the cave isn’t too crowded with tourists at that time of the day. 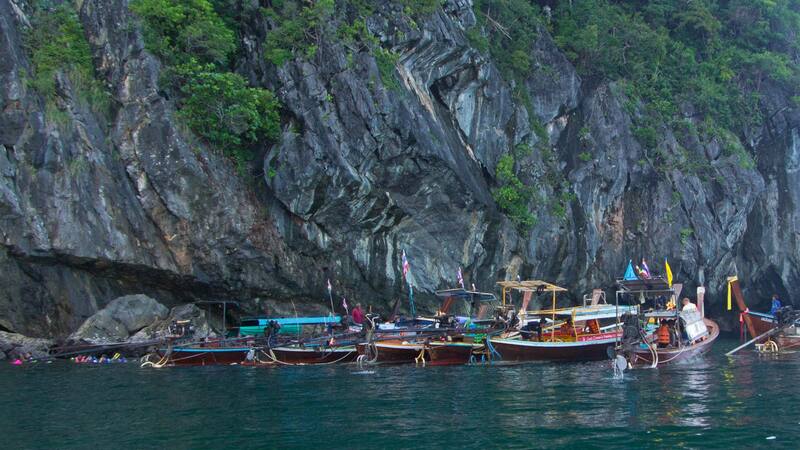 The Emerald Cave, also known as Morakot Cave, can’t be accessed with a longtail boat. Bottom line is that you will either have to swim through a 80 meters long tunnel to get inside to the beach or you have a kayak with you to paddle through that tunnel. Some people do that as well. However, the visitors don’t swim alone through the partly dark cave but rather have a guide to lead them. In our case one of our boatmen came along with us. He swam ahead using a flashlight and lit us the way. It was a really short stretch of darkness until you saw light at the end. We thought it would be way worse and longer, but it’s actually nothing to worry about! 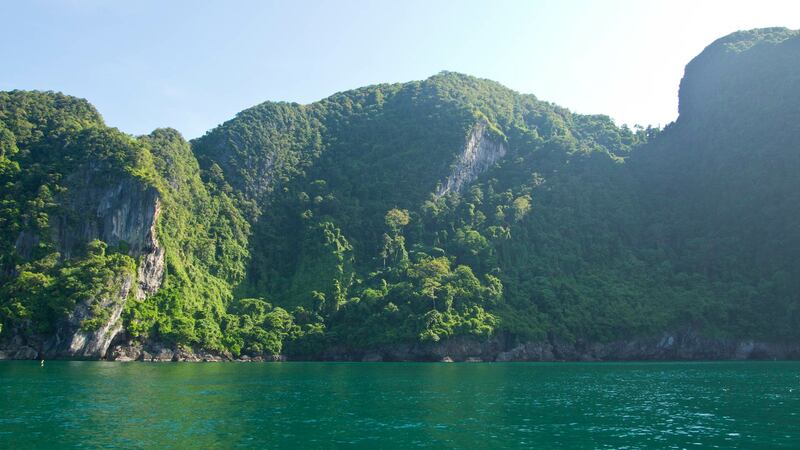 Koh Mook, the cave and the surrounding islands are part of the Had Chao Mai National Park and usually you have to pay a national park fee to visit the Emerald Cave. However, there was no one on site when we visited the cave to claim the fee. Inside the cave you can relax at the tiny beach, take some pictures and enjoy the impressive atmosphere of the cave and the jungle before you swim the way back. By the way, the cave was originally used by pirates as a hideout for their prey. You can only reach the Emerald Cave during low tide and because of that it was a perfect hiding spot for the pirates. After the stop at the cave we went on to Koh Ngai. From Koh Mook to Koh Ngai it’s perhaps a 20 to 30 minutes boat ride. During the trip you will come past many islands which are often used for snorkeling trips. 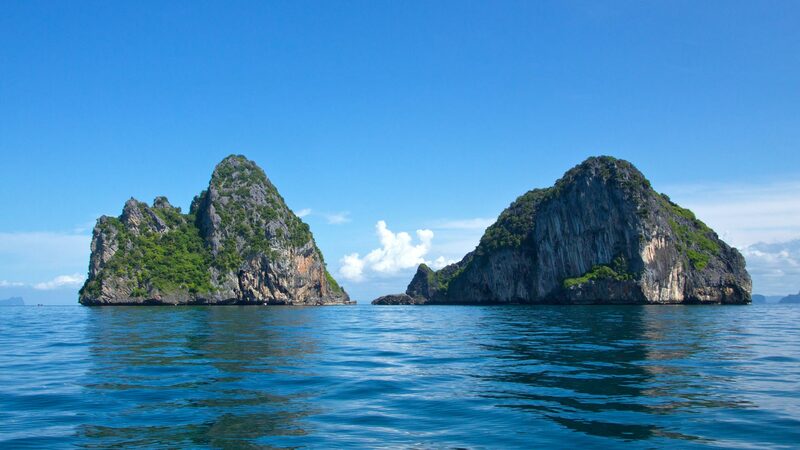 There are 3 more or less big islands on the way to Koh Ngai. The first one is Koh Chueak. It consists of 2 huge limestone cliffs. Most boats stop between the cliffs and you can directly jump into the water from the boat to go snorkeling. Unfortunately, there isn’t a beach on none of those islands. Then there are Koh Waen and Koh Ma. 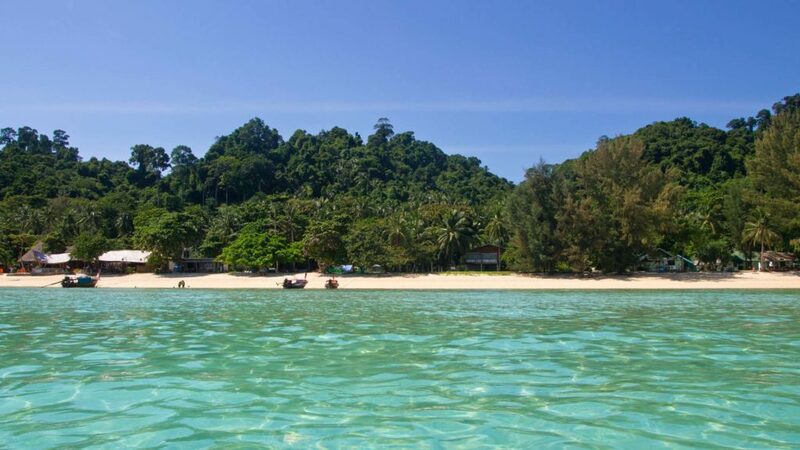 The last-named island has the same name as one of the islands on the west coast of Koh Phangan, which you can access through the Haad Mae Haad Beach. 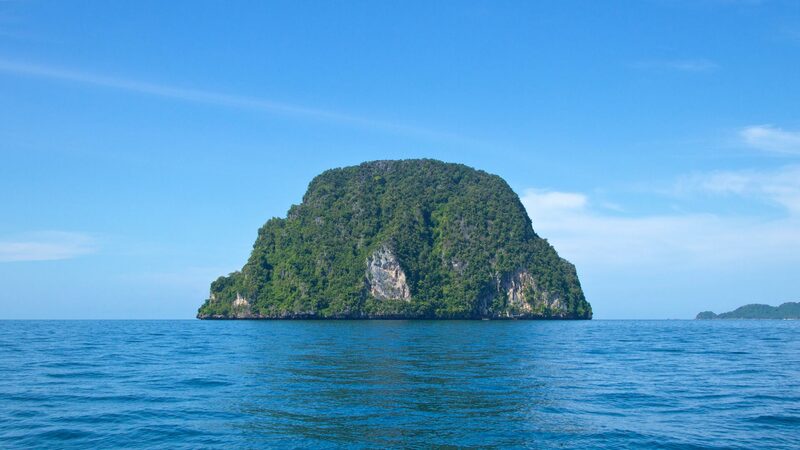 It’s not unusual that islands in Thailand have the exact same name. Don’t get confused by that. Past these islands you will eventually arrive on the paradise-like island Koh Ngai after a short boat ride. The journey is already exciting and beautiful! The arrival on Koh Ngai is just terrific. You will float the last couple of meters with the boat through shallow, crystal clear turquoise water. The island looks already beautiful from the boat. Actually I wished for a few more palm trees since I’m a big fan of palm-fringed beaches. 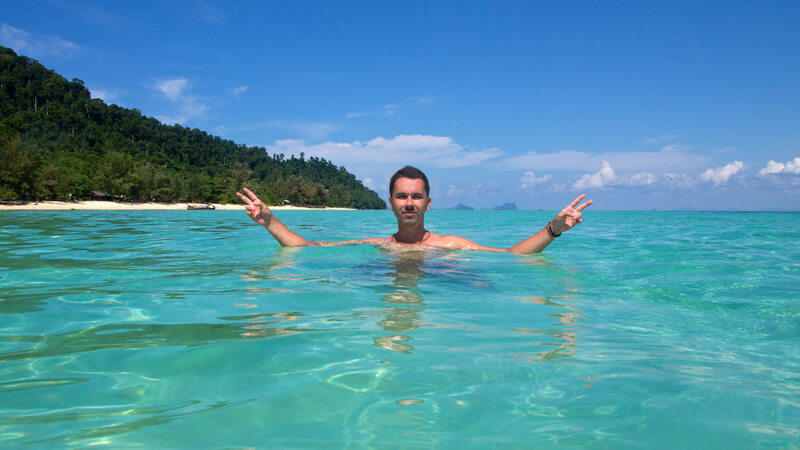 Like I said before, there isn’t much to do on Koh Ngai. No roads and no shops at all. Only a few resorts at the beach. 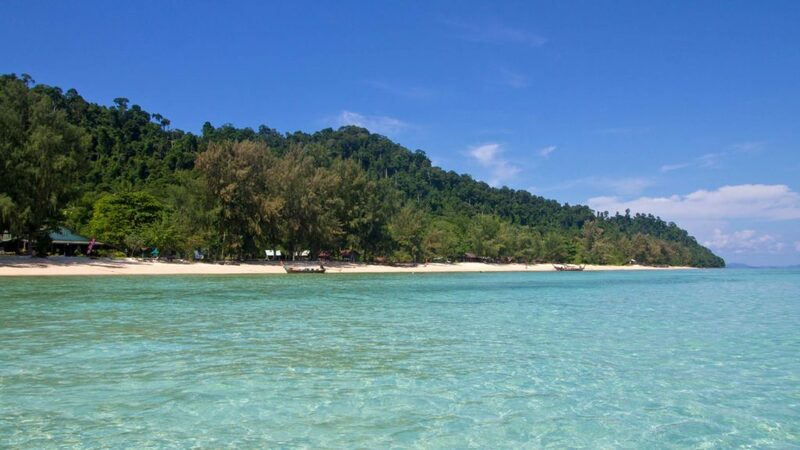 These resorts are usually more expensive and if you want to save some money on accommodation, then I recommend you to stay at Koh Mook and just visit Koh Ngai for a day trip. We brought some food for lunch, went swimming and snorkeling. However, there are not so many fish in the water off the coast. Not really worth snorkeling. It’s maybe worth it a little bit further out, where the water is deeper. But for snorkeling Koh Chueak etc. are a better fit. So we just enjoyed our day at the ocean and the beach. Koh Ngai is a perfect location to take some pictures, because the scenery is fantastic with all those islands and the mainland in the background. Just like postcard motives. 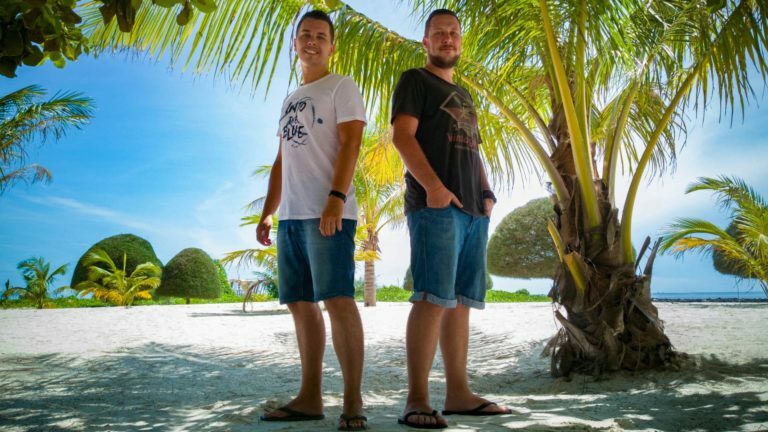 We spent about 3 hours at the beach, simply relaxing and enjoying the peaceful island. 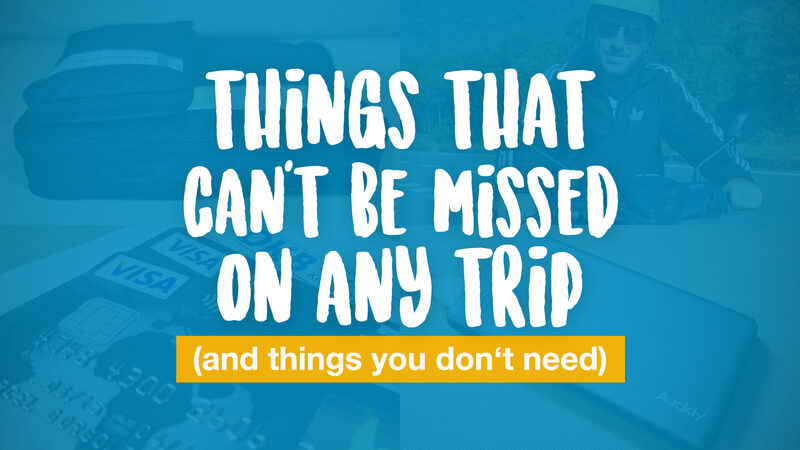 We can absolutely recommend a day trip to you! 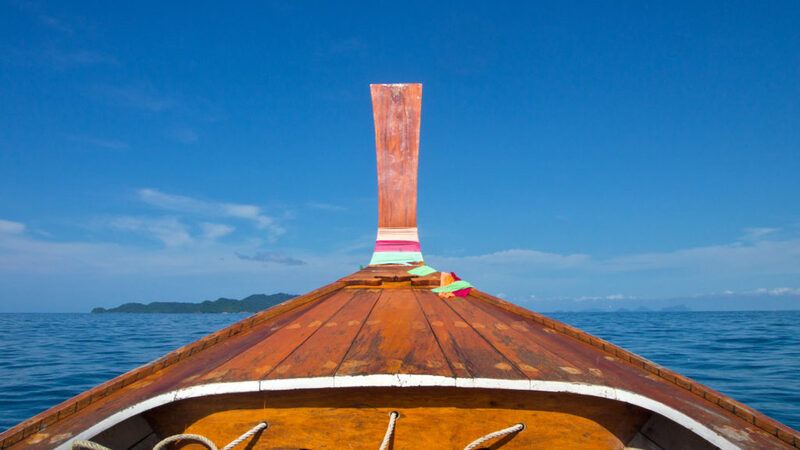 After a perfect day we went back to the longtail boat and drove off to Koh Mook. The return trip was a great end of the day as we were passing those beautiful islands again and enjoyed an amazing view at the mainland of Trang. Have you ever been to Koh Ngai? Did you do a tour in the area? Did you like it? Leave us a comment below! We took a private longtail boat from Koh Mook to Koh Ngai. We just asked at our resort and they arranged something for us. I think the price will be slightly higher today, but is still always negotiable. Would you mind me asking how much it was to rent a long tail boat & driver? and if it was possible to travel here from Koh Lanta? Thank you!! This looks amazing! I think we paid between 1500 and 2000 Baht for the whole day. We did it from Koh Mook, so I’m not sure if it’s possible from Koh Lanta. 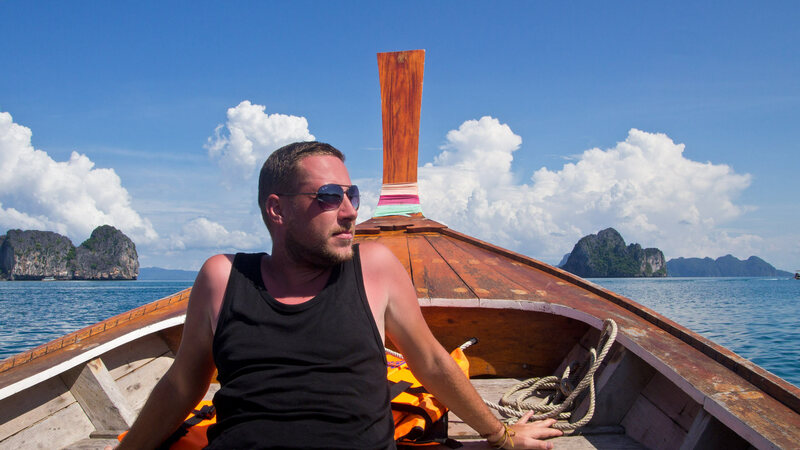 Koh Lanta is actually a little bit further away so it might take some time to get to Koh Ngai by longtail boat. 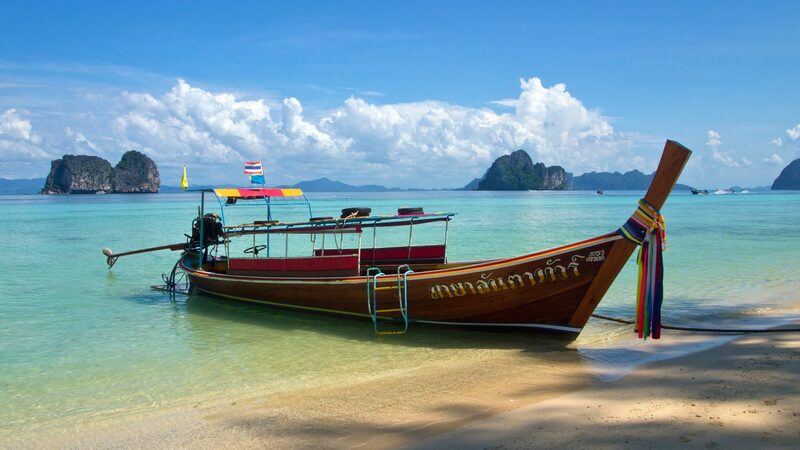 I just know that there is a ferry to Koh Mook and Koh Ngai during the high season from Koh Lanta.